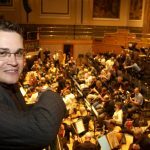 International choral festival puts Cardiff on musical map | News by Wales Express News, People Before Profit! Choirs and judges from as far afield as India and New Zealand will be heading to Cardiff to compete at an international competition where the judges will include a royal composer. This is the second year of the International Choral Festival which will be held at Hoddinott Hall and the Millennium Centre over the Easter weekend. The festival is the brainchild of one of Wales’ leading choirmasters, Eilir Owen Griffiths, the former musical director of the Llangollen International Music Festival. Professor Mealor also composed Wherever You Are, which became the 2011 Christmas number one for the Military Wives under the baton of Gareth Malone. Among the competitors will be a Mizoram Synod Choir from India, the Cadetta Youth Choir of Derry, Ireland, the Cantabile Choir of Hereford, England as well as a host of Welsh choirs. According to Mr Owen Griffiths, a senior lecturer in the Performing Arts at the University of Wales Trinity St David, the idea came from a discussion with members of his award-winning CF1 choir about creating a choral festival that would attract choirs from across the world to the Welsh capital. The choirs will compete on Saturday, April 20, before coming together for a series of workshops on Easter Sunday. The headline sponsor for this year’s event is the pioneering care organisation, Pendine Park, via their Pendine Arts and Community Trust which was set up to support arts-related and community activities. Mr Griffiths said: “I’m thrilled we will be welcoming the distinguished Mizoram Choir from India as well as the other international choirs. “We wanted to have an educational element to the festival and have top choral experts on hand to both judge and offer advice and guidance. He added: “And with Welsh choirs taking part, such as, Côr Merched Ger y Lli from Aberystwyth, Cordydd from Cardiff and Côr Godre’r Garth from Pontypridd, the standard is going to be high. “I will be chairing the panel of judges and will be joined by three others. Bernie Sherlock, who conducts the chamber choir, the New Dublin Voices is also a lecturer in music at Dublin’s DIT Conservatory of Music and Drama having previously lectured for many years at Trinity College Dublin. “It’s going to be a special event. I’m particularly delighted Lachlan Craig is coming over for the festival. He is the musical director and conductor of the Auckland Youth Choir which, under his leadership, has grown to become one of New Zealand’s largest and most successful community choirs. “Lachlan is in growing regular demand in New Zealand and abroad as a tenor soloist, conductor, teacher and adjudicator. His star really is on the ascendant in choral circles. The work he is doing is remarkable and he really is going to be a huge name in the choral world for many years to come. “Of course putting a festival such as this together is never an easy task and we couldn’t do it without the support of the Pendine Park Arts and Community Trust which is backing the event. “Their sponsorship means we have an overall main prize of £2,000 and prizes of £200 for each category. Categories include, youth choirs, young voice choirs, mixed choirs, single male choirs and single female choirs and an open category. Mario Kreft MBE the proprietor of Pendine Park Care Organisation says the Arts and Community Trust was established to support cultural and community initiatives. He said: “The International Choral Festival Wales will bring together choirs from across the world in Cardiff for what will be an excellent competition and event. “I know Eilir well from his years as artistic director of the Llangollen International Music Festival and I know what he, and his team, are trying to achieve. “This is a festival with huge potential and the quality of adjudicators is phenomenal. I’m looking forward to hearing these choirs perform both in competition and at cultural events over the three days at venues around Cardiff.